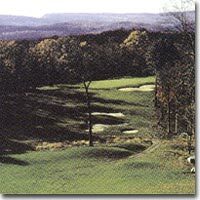 Country Club Of The Poconos' crown-jewel is an 18-hole, Fazio-designed course featuring some of the most challenging and picturesque holes in the entire northeast. But don't be fooled by the yardage. This course puts a premium on accuracy, not driving distance. CCP's signature, par-four 16th hole covers 420 yards, while the tee box -- elevated 150 feet above the fairway -- offers one of the most spectacular vistas you'll ever see. Please note: Golf members of the club have uncontested tee time priority. A limited number of annual non-resident and business memberships currently are available. Terrain: Narrow fairways, thick woods and wetlands line the fairways. Miscellaneous: No denim, collared shirt and bermuda shorts required.